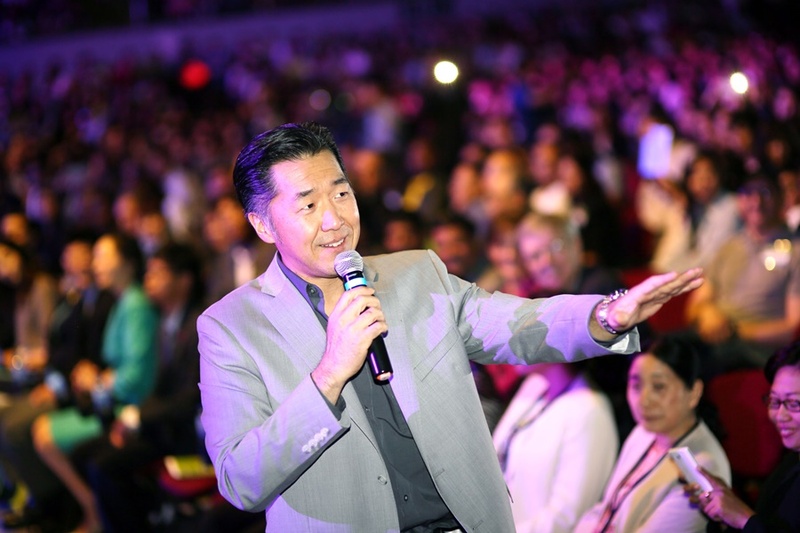 15,000 speakers, participants from the 2017 Global Peace Convention and international guests from thirty-five countries assembled at the Mall of Asia Arena in Manila, Philippines on March 3 for the Global Youth Summit, an inspirational program to clarify and uplift the values that can guide future leaders in addressing the urgent issues in the twenty-first century. The event, “Moral and Innovative Leadership: New Models for Peace and Development,” adopted from the Global Peace Convention theme, focused on the essential leadership qualities required to bring about peace and shared prosperity. Many participants are actively involved in groups dedicated to resolving global problems, such as hunger, poverty, and climate change. In opening remarks, Dr. Hyun Jin Moon, the chairman of Global Peace Foundation, said, “Young people are the future, they are driven by a passion that leads to ownership of a dream which leads to making the dream a reality. ‘If one person has a dream,’” he said, quoting the Mongol leader Genghis Khan, “‘it is only a dream, but if all people share that dream, it becomes a reality.’” Likewise, Dr. Moon believed that youth leadership could make his dream for a united Korea a reality. Other speakers addressed particular global issues, and the leadership responsibilities needed to resolve problems or guide society through the complexities of change. Karen Davila, broadcaster for ABS-CBN, spoke of the power of social media. According to Davila, social media can easily manipulate the popular opinion through exposing users to news sources or opinion that only share a similar point of view. She advised avoiding online harassment and so-called fake news that cite no reputable sources. She said that young people were the major users of social media, therefore they had the power to influence the world. Another speaker, Anne Curtis, celebrity ambassador of UNICEF, said the lack of quality education for children was a pressing issue with implications for the future. She said that education in childhood is crucial for development. The songs and rhymes you learned in your childhood stay with you throughout your life, she reflected, therefore childhood education is crucial for the rest of your life. “Be the initiative you want to be and share with your community how quality education is actually important,” she advised. The summit further celebrated youth leadership by rewarding winning project proposals from groups of young people. These proposals were in response to the issues discussed by the speakers, and the winners were presented with cash awards for their contribution towards peace. A constant high, positive energy elevated everyone at the summit. Speakers and audience were regularly engaged with each other, and participants were encouraged to ask questions or share their thoughts on global issues. There were also social media contests and raffles for uploading pictures and posts about the summit. Participants found the summit memorable and inspiring, leaving many hopeful about resolving the difficult world issues in their lifetime. One delegate said he found the Global Youth Summit amazing by informed him on global trends and role of the youth in leadership. Another participant said that he realized the importance of youth leadership, and that the next generation will be the mission force in bringing change. Global Peace Youth Philippines and SM Cares organized the Global Youth Summit, which was also supported by Commission on Higher Learning and Kagawaran Ng Edukasyon.